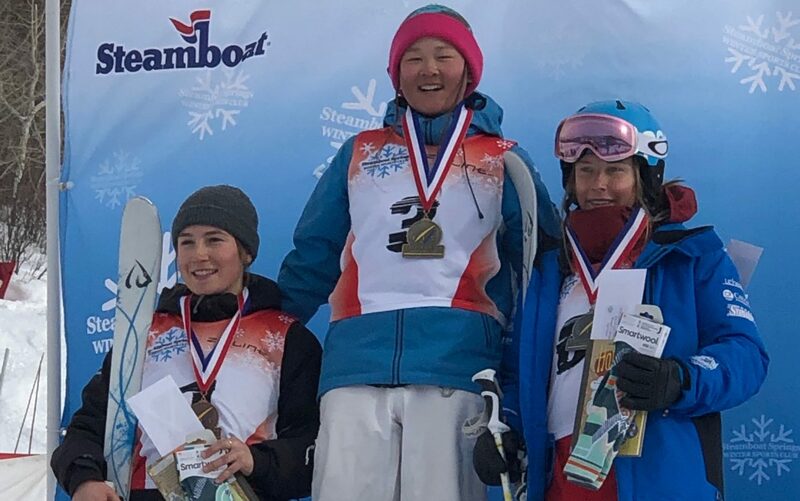 Vail freestyle athlete Kai Owens, 14, on top of the North America Cup podium in Steamboat Springs on Saturday, Feb. 23. Owens is the youngest skier in recent memory to win a moguls competition at the NorAm level. Vail moguls skier Kai Owens has always had a goal of winning a North America Cup event. The 14-year-old didn’t expect that dream to come true so soon, however. “At the beginning of this season my goal was just to get top-16 finishes,” Owens said. But then she started working more with coach Riley Campbell, and focusing on her strengths. “He comes up with the plan and I execute,” she said. On Saturday, Owens became the youngest athlete Campbell has ever seen notch a win at the North American Cup level. She appears to be the youngest American to win at the North America Cup level in recent history, Campbell said. “Kai has been a pleasure to work with this season and has shown herself to be an amazing competitor,” Campbell said. The sport of moguls skiing requires a lot of on-the-field play calling from coaches. Athletes must adapt to the course as they try to notch the fastest time on the day in their individual runs. But they must also adapt to what the other athletes are doing, as there’s a scored component of the event which comes into play, as well, during the two jumps on the course and the overall impression the skier leaves. A piece of timeless moguls wisdom was passed on from Campbell to Owens at Saturday’s NorAm event in Steamboat Springs. “You need to do what it takes to win, but you don’t need to do more,” Campbell said. It stuck with Owens, because she had been dreaming of increasing the degree of difficulty in the trick she was performing off the first jump on the course. Campbell determined it wasn’t necessary. Campbell said some of his previous coaching with another Ski & Snowboard Club Vail athlete came into play a bit. Owens said Johnson has been a big inspiration for her. Johnson just won a bronze medal at the World Championships on Feb. 9. Campbell said the fact that the role models of the sport are so up close and personal at Ski & Snowboard Club Vail is helping to perpetuate an atmosphere of success in the program. Kai Owens said she’s had to adjust her goals for the season, with top-16 finishes now becoming a forgone conclusion for her at the NorAm level. “I really want to be top-3 overall on the tour this season,” she said. She’s currently ranked third with one more event on the calendar.